Over the past year or so, I’ve been trying to expand my horizons a bit and listen to some of the newer groups that are “paying their dues” in the SG industry. A frequent topic of discussion on these blogs is the future of our genre. Well over the past year or so, I’ve found several groups that reassure me that SGs future is in good hands. This is not to knock any others, but these four groups especially give me great hope for the future of the music that we all love. The Crist Family – This mixed group just has it right. Their latest CD, Declaration, is phenomenal. They’ve got good material, great arrangements, incredible talent, and dedication to their craft that is unparalleled. No one takes the musical risks that these guys take, and their style is fresh and innovative. They are the real deal, and should be one of our top mixed groups for years to come. The Ball Brothers – What the Crist Family is to mixed groups, the Ball Brothers are to male quartets. They have a sound all their own, with incredibly tight harmonies, and a polish to their sound that a lot of groups that have been on the road for much longer don’t. I’m anxiously awaiting their new disc, Breakthrough, to hear what kind of inventive sounds they come up with this time. These 4 young men should make an indelible mark on our industry for a long time. The Dills – Another mixed group that has an incredibly smooth blend, and show an amazing amount of versatility. Their latest CD, Story Of A Lifetime, is a big step forward for them, both in the strength of their material and in their arrangements. “Holy of Holies” is an absolutely incredible song that could become a sugar stick for them. They’re young, they’re talented, and they are dedicated to constantly improving their overall sound and presentation. Shawn Dill is one of the most underrated vocalists in SG today, what a great voice. They’ll be around for quite a while. Mike Lefevre Quartet – OK, so calling them a new or up and coming group is a bit of a stretch, but they’ve really started picking up since signing with Canaan. Again, these guys are on the cutting edge of male quartet music. Stacey Bragg isn’t a subsonic bass, Gus Gaches isn’t a screaming high tenor, but they are flat-out good. These guys perform some of the smoothest vocals you’ll ever hear, the material on their latest CD, Nothin’ But Good, is incredibly strong, and I rated that CD the top CD of 2008. These guys are just starting to make their mark on the quartet world, and should become one of the major influences in SG. There are other great newer groups out there like the Collingsworth Family, the Browns, Tribute, and Brothers Forever, but these four deserve special mention. At least, they do in my opinion. So to all four of these groups, keep doing what you are doing, stay the course, and Southern Gospel music should thrive for years to come with these groups taking a greater and greater place on the scene. As popular as these two groups are, and as talented as they are (two of my favorites, even), I still can’t point to the one “monster” song that has defined their career. Legacy 5’s closest is probably their debut single, “I Stand Redeemed”, but it still isn’t the “signature song” that “Midnight Cry”, “When He Was On The Cross”, or “Get Away Jordan” has been. With Triumphant it is even harder, though “Don’t Let The Sandals Fool Ya” was and is pretty popular for them. What do YOU think? And who would you add to the list of groups that still haven’t had that one smash of a song that is a line in the sand and a measuring stick for all others? This is the latest release from The Dills. It is currently available on pre-order, and should be shipped by the end of the month. I was able to listen to a mixed, but unmastered, copy of the disc to review it. Overall: 8.5/10 This CD is a nice progression from their last one, Uncommon, and it really plays to their strength as a group of keeping them walking down a line that blends the best of the Progressive/Contemporary and Traditional styles. Also, thanks to all involved for a full 10 tracks on this disc. That was the only real complaint I had with Uncommon, it seemed really short with 9 tracks. There are several really strong songs on the album, which is a testament to the ability of the group and their producer to pick material that plays to the strength of the group. The Dills’ producer, Kevin Ward, really knows how to get the best from them. As good as Uncommon was, this CD is definitely a nice step forward from even that disc. Pick this CD up the first chance you get, it will provide you hours of enjoyment! Last night we had The Dills at my home church. The crowd was decent, but a bit disappointing, with my guess being about 150-175. The people that were there were very enthusiastic, however, and a lot of that credit goes to Tim Dill, who has improved as an MC by leaps and bounds from when they were at the church last year. Being the unofficial assistant music director has its perks, as I was able to sit in on their sound check, and they took the opportunity to run through some songs from their new CD, which will be coming out in about 3 weeks. Be looking for it, as the songs I heard them sing were very strong. While I enjoyed their concert last year very much, they have really grown tighter as a group over the past year, and Tim Dill is really coming into his own as an MC. Their performances were wonderful, varied in style and they connected very well with the audience. Especially impressive was their versatility to go from a worship style with “Lord I Lift” and “Days of Elijah” into a classic SG mode with a medley of “Sheltered” and “Thank You Lord”. Tim then did a commendable job on “Who Am I.” To juxtapose two diametrically opposite styles in such close proximity, yet retain a deliberate flow to the service is extremely impressive. They did perform two songs from the new CD: “Holy of Holies”, which is a big-time ballad that was previously recorded by Truth, and “I Want To Live”, though I’m not 100% sure on that song title. 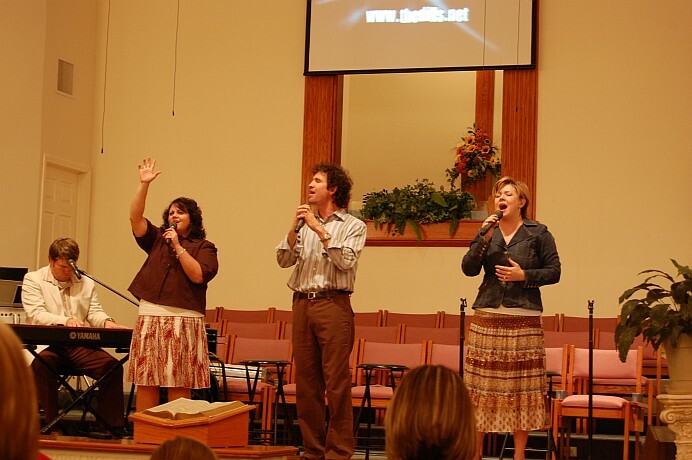 “Holy of Holies” is a tremendous song, and should become a signature song for the group. Shawn and Bridget once again nailed “The Prayer”, and Shawn brought the audience to their feet with his great rendition of David Phelps’ hit “End of the Beginning.” Not to be outdone, Tim also got the audience on their feet and clapping along with “I’m On Tour.” (Tim, make the check payable to….) 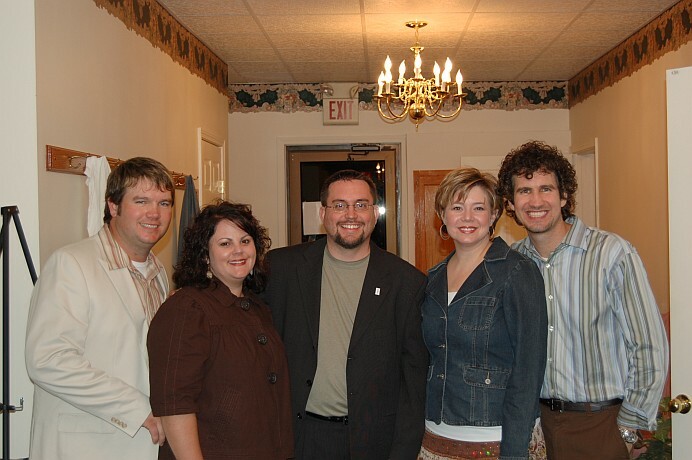 Leeann did her typical solid job, especially with “Lord I Only Want.” Their vocals were precise, and the blend was magnificent. These four are very talented vocalists, and take their craft very seriously. That dedication shows in their performances. 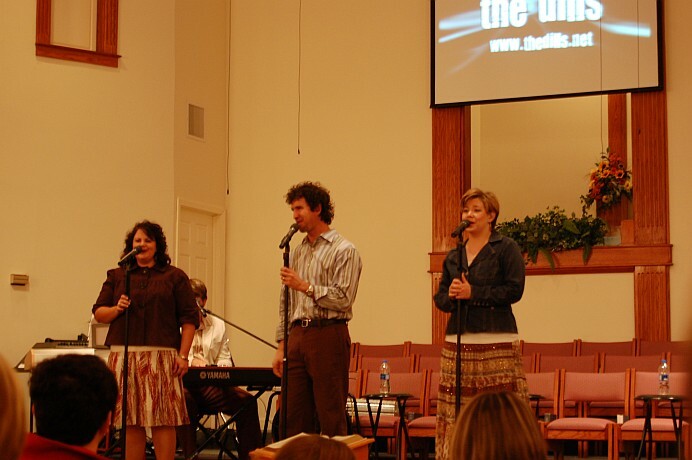 The group actually has several videos that play along with their singing, but they use an especially moving video with “Uncommon”, which allows them to move quickly into “Jesus Never Fails”, which creates a very fitting mood to extend their invitation. This is one of the best selection of songs to move a service towards an invitation that I’ve seen. They ended with a break-neck tempo rendition of “Walk Right Outta This Valley” that left the audience wanting more. The Dills have really matured in their sound and presentation over the last year. When you see them in concert, expect a wide variety of styles, smooth vocals, and arrangements that highlight the strengths of each of the vocalists. From what I heard during soundcheck and in the concert, their new CD is going to be extremely strong. Go see them when they are in your area, you will really enjoy hearing them. Since I now have the super duper digital camera, I’m going to start posting a couple of pictures with my concert review, so enjoy these. Oh, and the last picture is of your friendly neighborhood blogger with the group. Just a reminder for any of you readers in the Memphis area that my church is hosting The Dills on Sunday night at 6:00PM. As always, no admission, a love offering will be taken, and come on out and enjoy a nice evening of gospel music. Go to the church website for more info, and be sure to say hello. 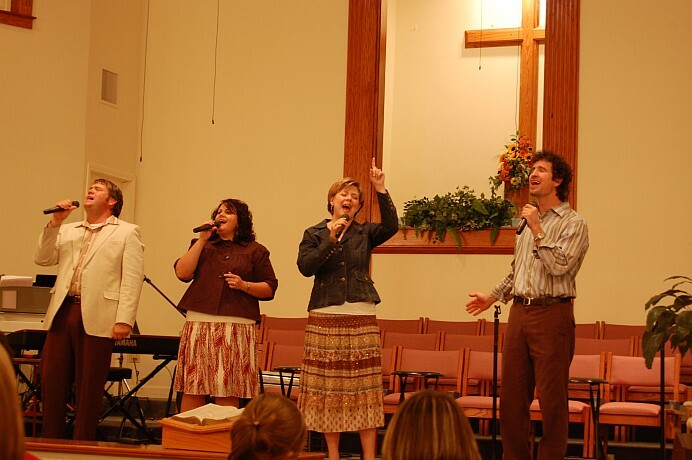 A new trend seems to be popping up in the Southern Gospel industry. Artists are beginning to seek input from their fans when working on a new recording. The Talley Trio started their Talley Tree-O website for this purpose, and according to their latest e-newsletter, The Dills have started a blog on their site for this same purpose. I think this is a great idea, because it serves the purpose of reconnecting the artist with their fans. I recently participated in a conference call with some other bloggers and industry personnel, and this very concept was discussed fairly at length. It also hearkens back to something that DBM had posted a while back about the concept of 1000 True Fans. I think this is a great way for artists to develop these “True Fans”, and in turn create music that their fans love, not just music their fans like. That can’t help but be a good thing for both the artist in question and the industry as a whole. Be looking for more groups to do something similar.